Jamil also brushed aside US along with European and Arab calls for Syrian President Bashar al-Assad to step down as a precondition for any future peace negotiations. But the country's foreign economic assistance negotiator hinted broadly that Assad may be ready to relinquish power as part of an agreed settlement. "As far as his resignation goes -- making the resignation itself a condition for holding dialogue means that you will never be able to reach this dialogue," said Jamil. 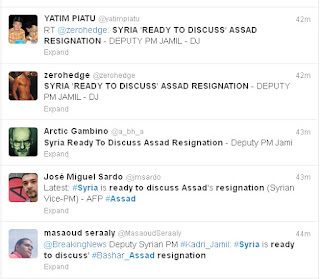 Later in the day, a headline started spreading quickly on Twitter, attributed to Jamil, stating that 'Syria is ready to discuss (president) Assad's resignation.' The headline was repeated by several users, including some high profile ones with some attributing it to AFP. It's obvious that the headline took Jamil's statement completely out of context and misrepresented what he said. Suggesting that it was breaking news made it sound like a significant development in the Syrian conflict, when in fact it was an abstract proposition on Jamil's part that even AFP's original piece didn't think is worthy of highlighting. It appears that all the subsequent tweets had repeated verbatim what one Lebanese journalist had said without attributing the news to him. Within minutes the headline was spreading very fast on Twitter. As you can see from the timeline, AFP hadn't yet tweeted the news even though this was supposed to be their breaking news. In fact, AFP did not tweet the news until later. 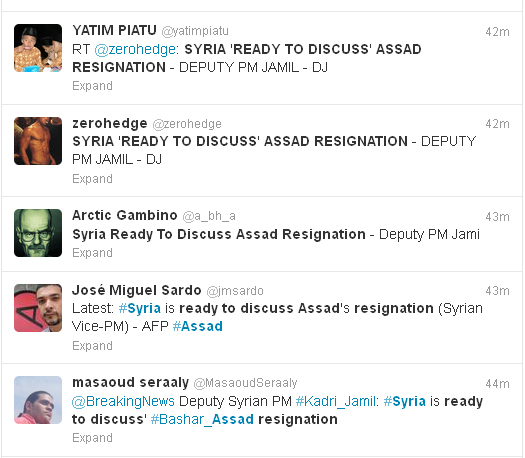 AlArabiya tweeted the same headline 15 minutes later. Shortly after, the headline started appearing on Google news results, as a legitimate headline. What had happened it seems is that in the rush to be the first to report the news, a news story that didn't make any waves when it was first reported was exaggerated purely as a reflex when it started spreading on Twitter. In this case, probably little harm was done, but this seriously raises questions how news, especially about Syria, are being spread casually and without verification. Meanwhile, the misleading headline continues to be circulated on social media.